I’m always in need of some PB and chocolate. It’s the reason why Reese’s Cups have been my favorite since I was 8 years old. On a rainy day, a little bored and in much need of some chocolate, I decided to experiment and make my own Reese’s. To mimic the peanut butter consistency, I added some powdered sugar, dipped it into chocolate and wah lah! Well, now I’ve become addicted to these little balls of goodness. I make them in the afternoon and finish them by nightfall. The size, crunch, peanut butter and chocolate are just a perfect mixture. Besides satisfying your chocolate needs, they also make a great gift. Just place them in a nice transparent bag and wrap a ribbon around it. Or make a couple batches and bring them to a dinner party. Everyone will love them and you. Here’s the recipe! They take very little time to make, trust me. So what are you waiting for? Go ahead and try them out. Place into the freezer and allow to cool. Then, enjoy! 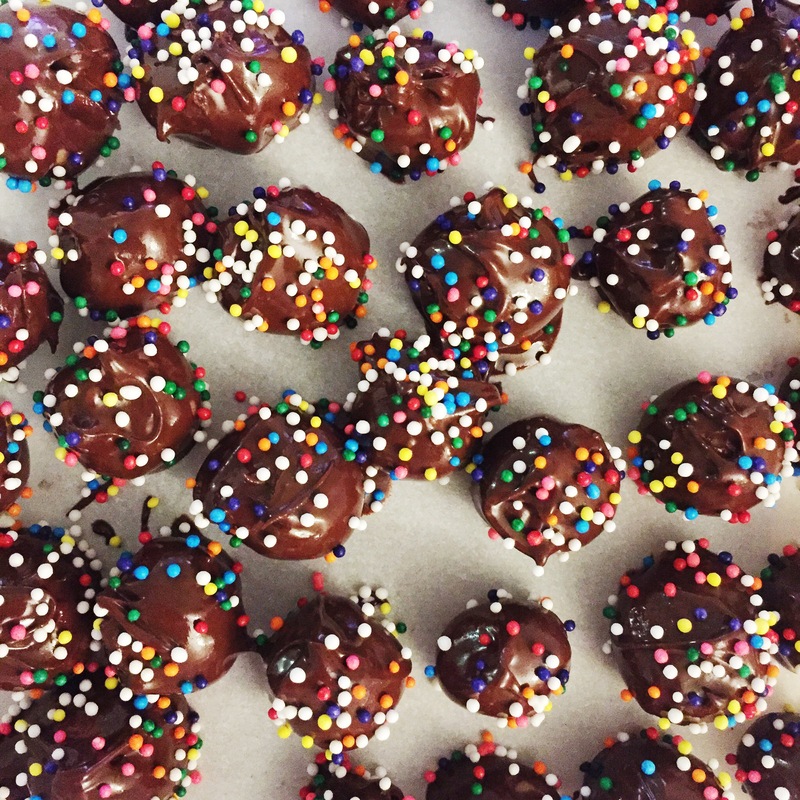 *Realistically you can make as many chocolate balls as you want. The trick is to have a 1:1 ratio of Peanut Butter and Powdered Sugar. The main point of adding the sugar is to make the peanut butter a sort of “dough” consistency. 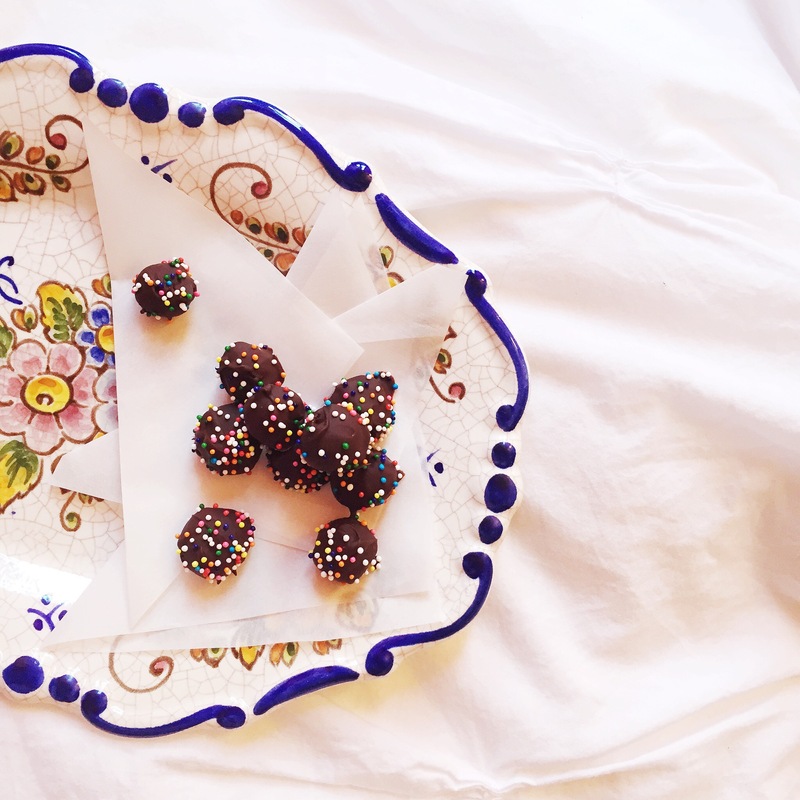 Don’t be afraid to add more or less of the powdered sugar to allow you to roll little balls and dip them into the chocolate. I like to use the Trader Joe’s PB because it’s not as sugary as other peanut butter spreads. Therefore, the PB dough doesn’t become too sugary when adding the powdered sugar.